Take your cornbread to the next level with a healthy twist of adding pumpkin and buckwheat flour! This Buckwheat Pumpkin Cornbread recipe is comfort food to warm every gluten-free and vegan soul without sacrificing taste! 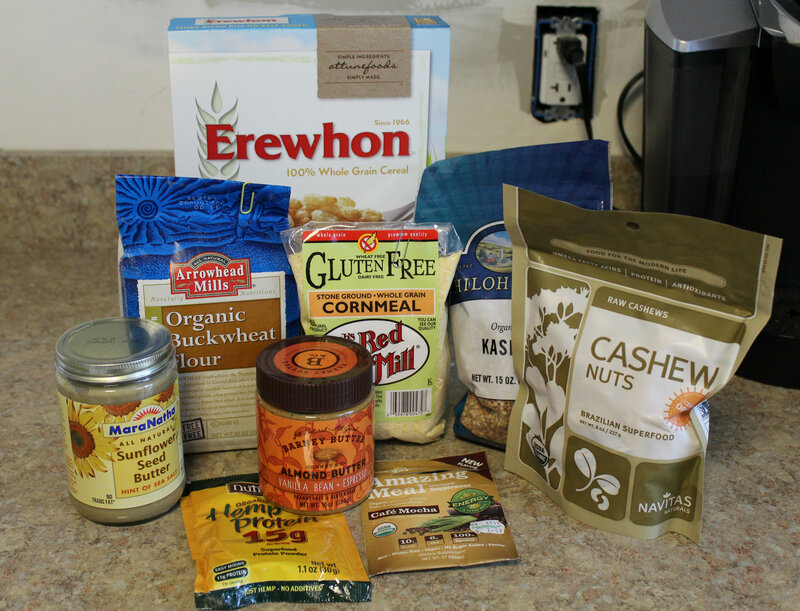 I have gotten some great food products from my recent Vitacost haul! I always feel like receiving a Vitacost shipment at the door is like a surprise Christmas! They just have so many fantastic deals, prices, and tons of products that I can’t find anywhere else. Here is a peek at the goods! I got some of my staples like Erewhon’s Salt-Free Brown Rice Crisps, MaraNatha’s Sunflower Seed Butter, Shiloh Farm’s Kasha, and Raw Unsalted Cashews. I also got some flours for the bread I wanted to make (see the recipe below! ), which includes Bob’s Red Mill Yellow Cornmeal and Arrowhead Mills Buckwheat Flour. Of course some nut butters: Barney Butter Vanilla Espresso and MaraNatha Sunflower Butter. I also picked up some sample protein powders at my local health food store, but I wanted to share those too! Amazing Grass Cafe Mocha Amazing Meal (which was amazing) and Nutivia’s Hemp Protein, which was lovely as well. It blended so well, no taste at all. Now on to this fabulous Buckwheat Pumpkin Cornbread I have to share! This may be the definition of the perfect Fall quick bread! Everyone needs a good cornbread during the Fall and holiday season. I always opt for sweet cornbreads and feel like they make the perfect “bread basket” side dish to a family dinner. Although, combining this cornbread with buckwheat and our seasonal pumpkin, makes this a fabulous breakfast, snack, tea-time treat, or the classic dinner side! It would also make a fantastic homemade gift to give or bring to any upcoming holiday parties you may be attending! Everyone loves edible gifts, am I right? Surprisingly, the intense flavor of buckwheat with the iconic taste of cornmeal goes so well together. The bread is nicely evened out by the pumpkin which keeps it nice and moist, but still with a great hearty texture. This is one of those breads that smells amazing while baking in the oven. It’s only spiced with cinnamon, but that does the job! It’s a “Hello, Fall!” bread through and through! Take your cornbread to the next level with the healthy twist of adding pumpkin and buckwheat flour! Buckwheat Pumpkin Cornbread is comfort food to warm every gluten-free and vegan soul without sacrificing taste! Preheat the oven to 375°F and grease an 8×4 loaf pan with coconut oil. In a large mixing bowl combine all the dry ingredients and whisk thoroughly together. Add the rest of the wet ingredients into the dry, mixing it all together. Pour the dough into the loaf pan and pop it in the oven for 30 minutes. Let cool completely before removing the bread from the pan. Stores well in an air tight container for about 3-5 days. This buckwheat pumpkin cornbread goes deliciously well warmed and with that vanilla espresso almond butter I mentioned above or a light drizzle of honey! I’m thinking I may have an obsession with cornbread and pumpkin, what do you think? + Favorite type of quick bread? Cornbread is a quick bread (any bread without yeast (rising time) is a quick bread! + What do you top your cornbread with?